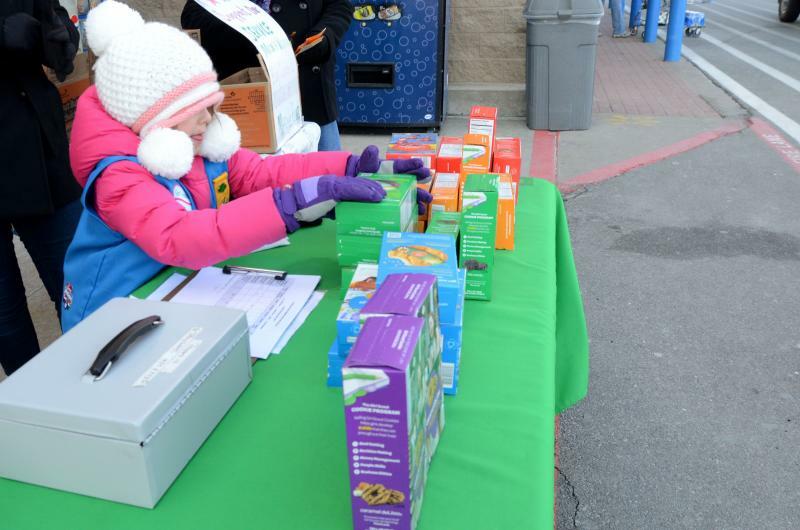 Maggie Flagg, 5, adjusts boxes of Thin Mint cookies at a Girl Scout Cookie booth sale Feb. 23 in front of the Walmart on Conley Road in Columbia. 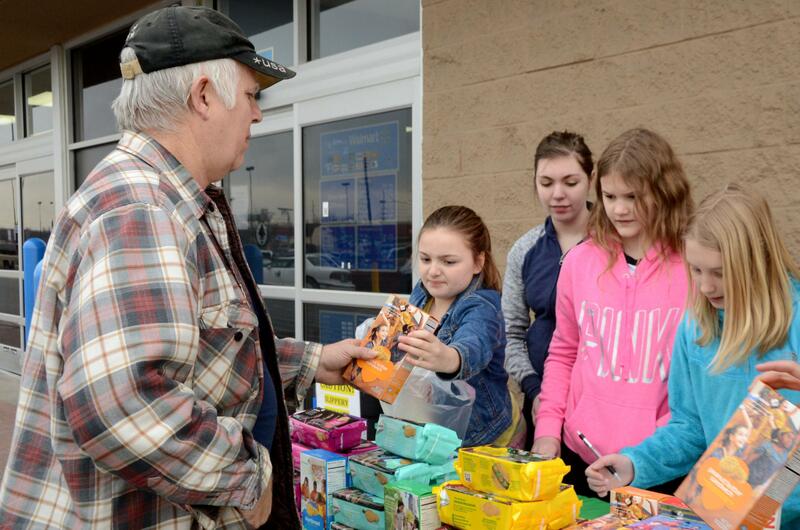 Maddie Renner, 11, reaches into the cash box at a Girl Scout Cookie booth sale Feb. 22 in front of the Walmart on Conley Road in Columbia. For a few weeks every year, Girl Scouts are selling cookies everywhere, from your front door to your office to your grocery store. And you know you can't help but buy at least one box. On a recent chilly Columbia weekend, several Girl Scout troops were out peddling their famous cookies in front of stores throughout the city. They stood in groups behind tables covered with brightly colored packages of cookies, from the ever-popular green-boxed Thin Mints to this year’s new Cranberry Citrus Crisps, wrapped in fuchsia foil. As shoppers walked or wheeled by, some of the girls called out to pitch their sales. Some wore fabric signs with pictures of popular cookies. “Girl Scout Cookies, Girl Scout Cookies, are the best, are the best. You should really buy some, you should really buy some, yes you should, yes you should." Behind all the bright colors and cute songs are some serious sales strategies. 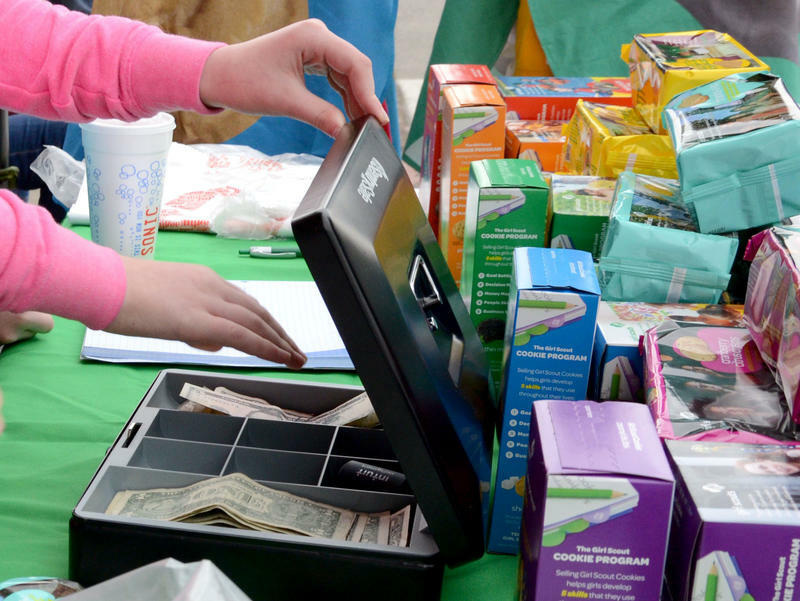 For one, Girl Scouts know how to have fun while doing business. Delaney Tevis, 16, was selling cookies with Maggie. She said that having fun and bringing a positive attitude can make sales more successful. "The best thing is just to be motivated and be happy, because if you’re excited and you’re cheering and singing songs or dancing or whatever, people are gonna, like, be more inclined to buy cookies from you than if you’re complaining about the cold weather," she said. Although they only sell for less than three months per year, Girl Scouts sell almost $800 million in cookies annually, according to Girl Scouts of the USA. So how do they do it? Mark Swanson teaches strategic writing at the University of Missouri. He said Girl Scouts have covered the four p’s of marketing: price, place, product and promotion. He says the $4-per-box price is a bit steep, but the cookies are good and the money goes to a good cause. The cookies are sold right at your front door; that's a convenient place. The product is tasty and packaged well. And though people typically think of promotion as TV commercials or print ads, the Girl Scouts take a more personal approach. Swanson also said Girl Scout Cookies are an iconic brand, like Harley-Davidson or Starbucks. Girl Scouts have the advantage of selling a product that people already love, but they still have to go out and sell the cookies. Tracy Landau is owner and president of MarketPlace, an agency that works in the food marketing industry in St. Louis. She said selling Girl Scout Cookies teaches young girls about sales skills. They learn to understand the features and benefits of their products, which is something that adults working in her industry also have to learn. The Girl Scouts selling cookies in Columbia had plenty of sales secrets to offer based on their own experiences. Isabella Garfias, 12, stressed the importance of being friendly. “The secret is just to greet them and just make them feel welcome, and to buy cookies, just, like, start talking to them and don’t stay quiet or be shy because then they won’t really be interested to buy cookies,” she said. Several girls, including 12-year-old Emma Burton, mentioned a package deal they’ve learned to offer when selling the $4 boxes of cookies. Big business tips aside, many of the girls kept circling back to the basics. Be friendly. Be outgoing. Be polite. And always say thank you. If there's a merit badge for business savvy, 13-year-old Girl Scout Danielle Lei might well deserve one. Danielle, who set up her table of Girl Scout cookies outside The Green Cross medical marijuana dispensary in San Francisco earlier this week, sold a whopping 117 boxes in a single day. She appears to have tapped into a niche market fueled by the drug's well-known propensity to stimulate appetite. According to a Facebook page for The Green Cross, Danielle had "to call for back-up Girl Scout Cookies" after 45 minutes. 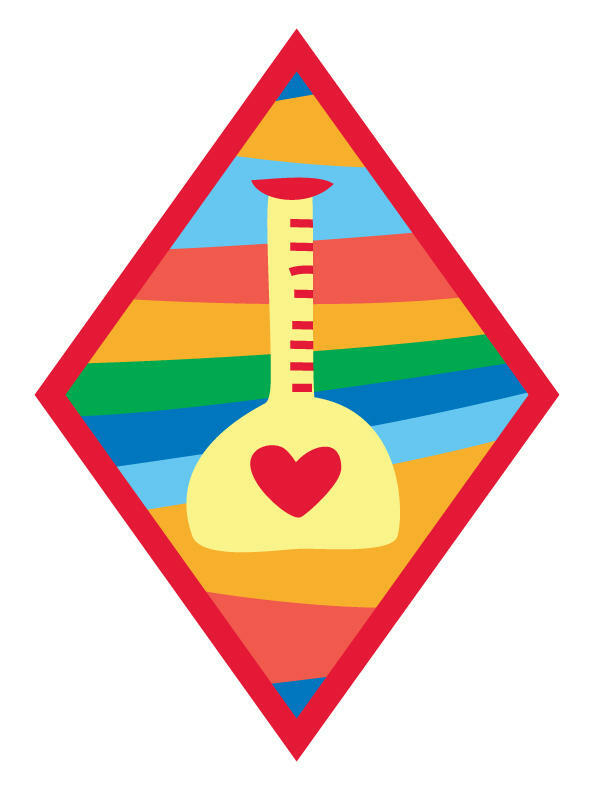 Today on All Things Considered, Alisha Niehaus of the Girl Scouts of the USA talks to host Guy Raz about a big update: For the first time in a quarter-century, they've completely overhauled the system of badges that Scouts can earn.